Oh! Are we not looking that excited? Perhaps this is because we have found out that this is not the World’s Longest Wooden Bench. That accolade belongs to a long wooden bench in Japan, built in 2011, which stands at 653.02 metres. According to various internet sources of varying reliability, Littlehampton’s bench stands at 324 metres or perhaps 342 metres, which means one of the sites has the “2” and the “4” mixed up. 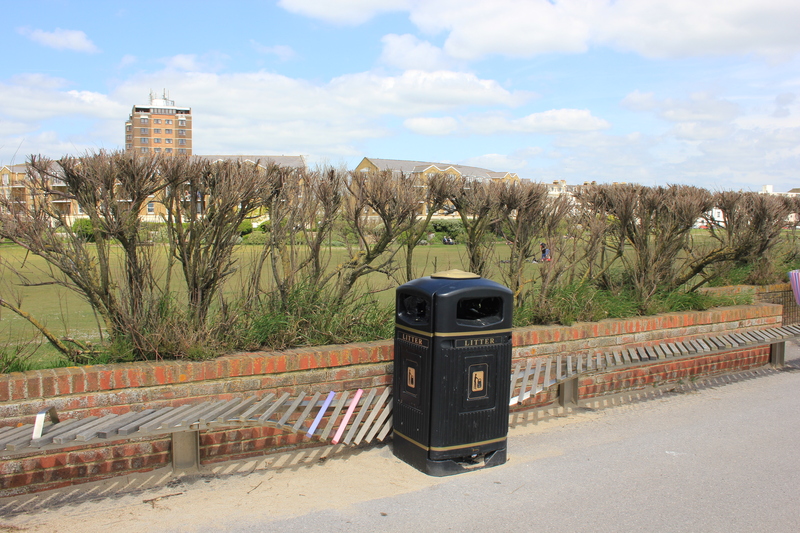 According to one hopeful website, Littlehampton’s bench stands at 655 metres. 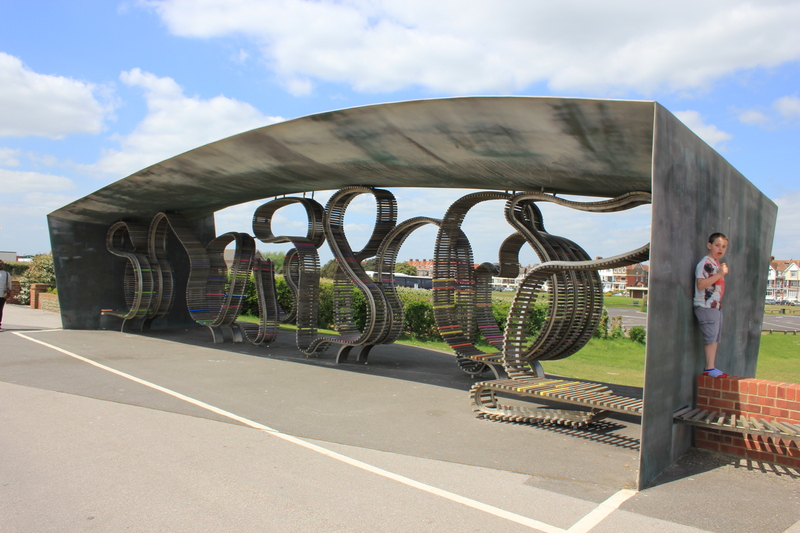 That would give it the crown of the World’s Longest Bench, but Guinness have yet to be persuaded – the figure is clearly wrong. One of the best things about this bench is that it has been incorporated into a work of art in various places. Wow! If only I had some Scalextric cars on me! These parts of the bench actually seemed quite comfortable! 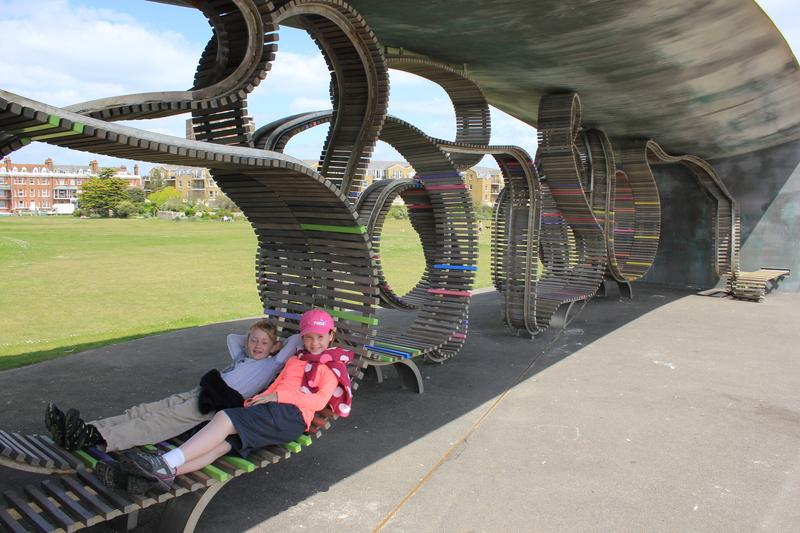 Littlehampton’s bench may not be the longest in the world, but it is the longest in Britain. Each of the 9,000 slats can be sponsored and dedicated to someone. There is a slat there somewhere dedicated to Anita Roddick, founder of The Body Shop. She died in 2008, but was born in Littlehampton and opened her first shop in Brighton. Her husband donated £100,000 towards the £500,000 total cost of construction. 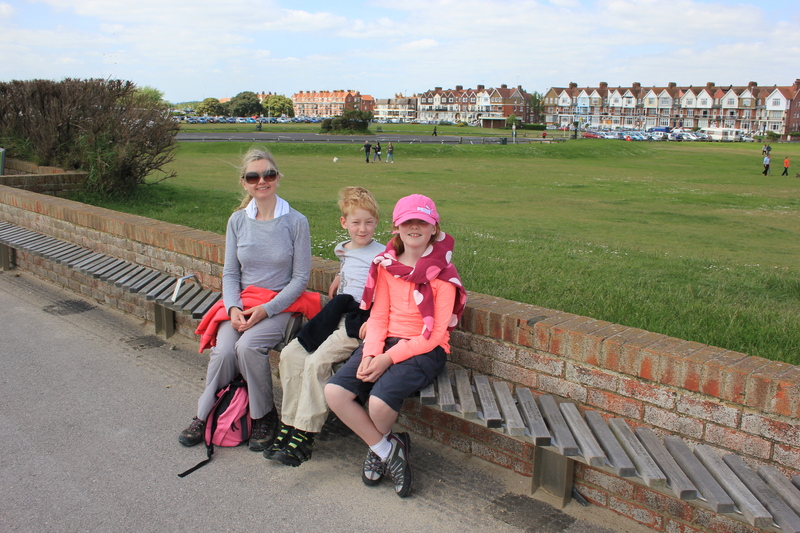 This entry was posted in West Sussex and tagged art, bench, coast, littlehampton, travel, walking, west sussex. Bookmark the permalink. How wonderful! I am from Texas but I was luck enough to live in Devon for a while and I had the opportunity to walk along part of the coastal path. It is one of my favorite memories from my time in England. I love that you are doing it as a family. I hope to have a similar experience someday! Thank you! The experience is worth it! 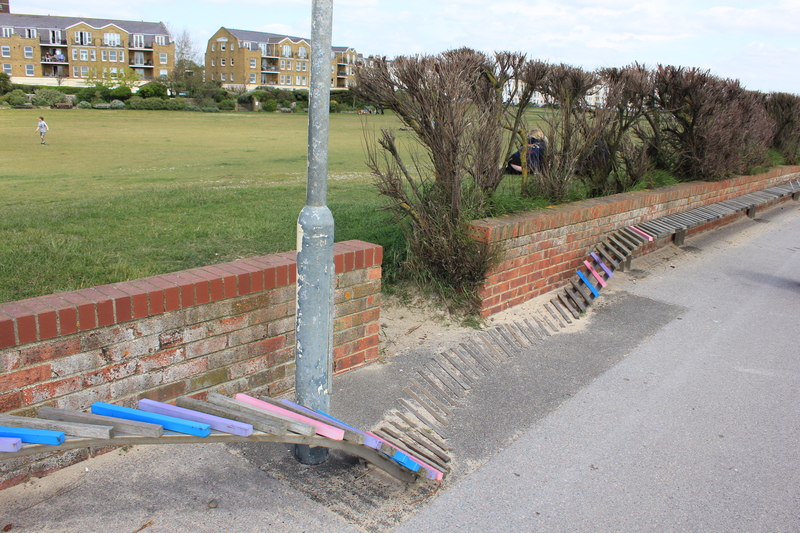 Don’t you think Littlehampton is cheating a bit with all the twirly bits of bench at the bus stop? Still, quite a remarkable piece of functional artwork for such a small place. Funnily enough I had to debate this with a friend of mine last week. In view of the fact that the bench is run into the ground at a couple of points (see the pictures) our discussion descended into a “when is a bench not a bench” dispute which was never resolved. All I can say is that I would prefer an interesting bench with lots of weird and wonderful variations to it than a boring old straight bench that has to be sited in the middle of nowhere so they can fit it in, and where it is so much in the middle of nowhere that nobody is around to sit on it and actually use the thing! So I suppose I will conclude that the bendy bits simply bend the rules as much as they bend the bench, but I’m all for it! Very entertaining. Functional, drolly artistic, and evidence of civic ingenuity. But wouldn’t it be ‘Hot Wheels’ or ‘Whizz Wheels’ rather than Scalextric cars, which would fail to loop the loop? I did actually consider putting Hot Wheels instead of Scalextric, but to me it just seemed more reminiscent of the latter. Besides, the way I drive Scalextric cars they’d make the loops without incident! Well, that stretch was great fun! Jill, I have no idea. We just keep plodding on and we shall find out!